I stepped on this iPad and my tiny feet somehow deleted all the emails. Posted August 18th, 2013 .
guess they weren’t important or not for the fur kid good baby!!!!! Cute little face! Let him play with the games! that’s should be a human shaming…. 😉 Silly hoomin! Leaving your iPad where tiny feet can walk on it. 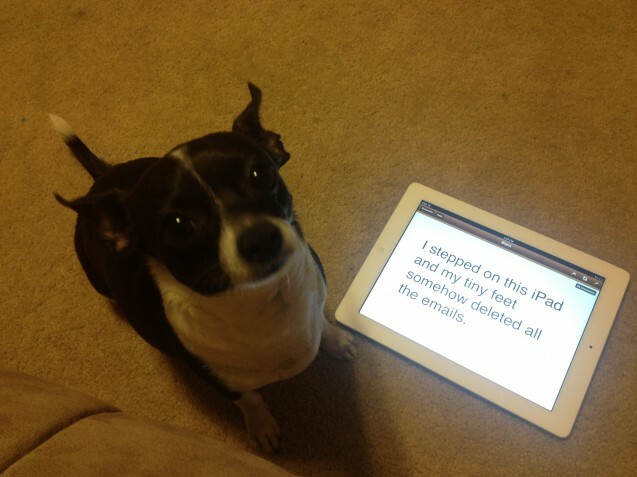 Mommie was mad at me, so I showed her she makes mistakes too, the floor is no place for her iPad!